Lyme disease rash. 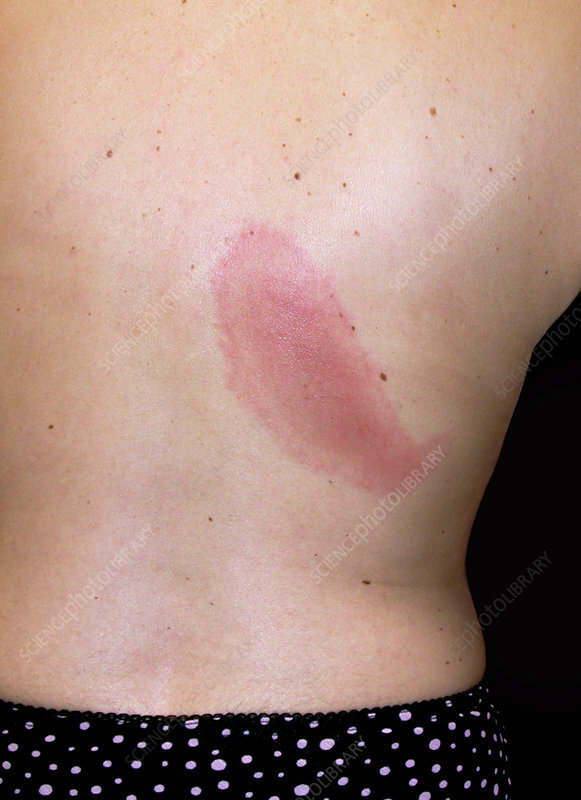 Close-up of the an erythematous rash around the site of a tick bite on a 50-year-old patient's back. This rash is characteristic of Lyme disease - an infectious disease caused by Borrelia sp. bacteria spread through the bite of an infected tick. Early symptoms include fever, headache, fatigue, depression, and a circular skin rash called erythema migrans. Lyme disease patients who are diagnosed early and receive proper antibiotic treatment usually recover rapidly and completely. A key component of early diagnosis is the recognition of the erythema migrans rash that is seen in about 80 percent of Lyme disease patients.